Turn 19. Can anyone spare a brand? or some gold? Can anyone spare a brand? or some gold? I have ~100gold left after recruiting 1adon, 1zamzumite, 1sage, only 1troop, 1indiescout. In province 285 the drain is -2rp from my magic scale+1. Thats a research hub too. Perhaps I should cancel 1sage and 1troop and build a temple there? I lost one of my gold mines this turn to indie random attack (the event wasn't listed and neither did I get to watch the battle but all I lost was like 0-3millitia+autorout) but the loss of income is really bad... additionally ehud can't reclaim the province because he has to go to a lab to give his gear to zach. Also in the west I shall assault a temple(unforted temples wtf?!?) of shinyuma's next turn and in the east I am continuing to siege a fort. With zach off duty as an assault leader perhaps I should break a unit off of the siege to continue reclaiming provinces. Thoughts? Suggestions? Offers to loan me a brand for Ehud? Or some gold for a temple next turn? Re: Turn 19. Can anyone spare a brand? or some gold? Gah Baalz plz either post where you're going to raid or check other people's posts. Though I admit, I changed my targeting between posts. But, not a big loss. Lost one party raiding Caelum to Baalz, Abysia and I exchanged a province, Pythium attacks me with just hydras which makes this thing a bit convoluted and Jotunheim anticipated my move. Oh well. 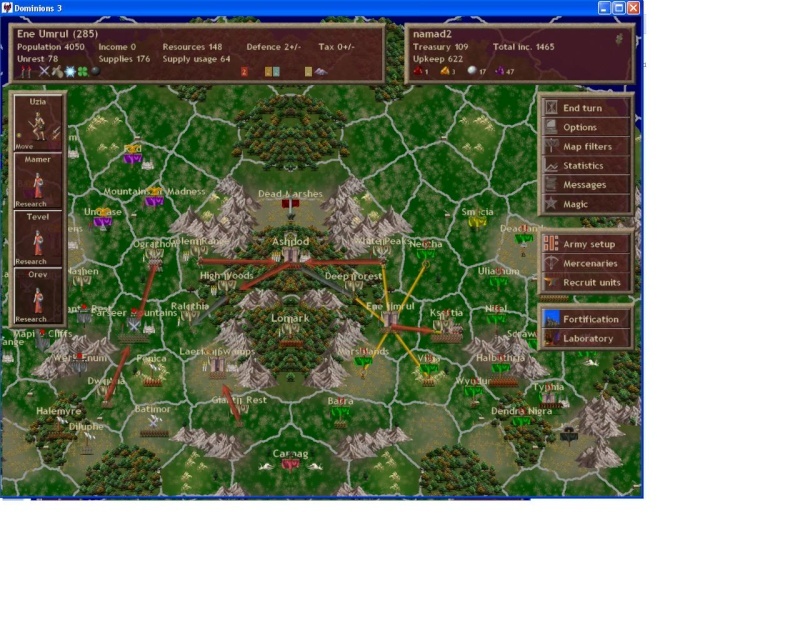 Namad, do you have troops capable of killing an army with 7 hydras, 2 arch theurgs and few archers in your capital? I'm trying to decide whether to fight or bail, and am not too confident with my hydra-slaying capability. Although flying into battle next turn... will probably be too slow to save you from the hydras and you will have to teleport out, and I will then be left to fend for myself? well either way if I am going to be fighting hydras I'll be needing a 2nd snake ring and a couple more brands (I gave my 2nd snake ring to thedemon recently). maybe instead of teleporting out someone could send you a snake ring this turn? or would that be too late for you to equip it... ? is this the turn on which you have to teleport away? I was kinda hoping you could buy a little more time... but it's definitely not a good idea to get your pretender killed in a battle you don't think you can win. Especially not when there are other war fronts you could teleport to that might be more suited for your pretender's chassis. So, I am sieged by C'tis again. Strange, but good. I think I can take C'tis. No idea where the Pyth army went, but it is gone. Basically just a Green Dragon to kill. We're definitely suffering somewhat from a lack of coordination here. I'm about to have a second communion army online. Make yourself some more bracers, maybe?!?! Should I make you some more? I'm forging Eriu another SoGG - does anyone need anything else? Let me know. My 1st Army is heading east towards Agartha/Pan with a battle communion. 2nd Army will be ready in a few turns, with a battle communion, heading west towards Ulm. Well if you could send me a shield/brand pair I think I could kill that abysian shambler army instead of chasing it through my lands. But it's small fry compared to all things going on around here so it's at the end of the queue. I'd rather you made me one or two bracers instead of giving me the earth gems. The reason I wanted earth gems was to make dwarf hammers which requires 9earth gems per turn. Atul offered to send me 9 earth gems this turn though which satisfies that desire for next turn and the one after it. If atul cannot think of a safe way to kill hydras.... I am in less danger of dying than ermor, or eriu... even if my capital were sieged by hydras... so maybe he should assist either of them? Probably a bad idea to send anything without 100 PR against those hydras. They take a long time to kill, and the poison damage adds up, even if you have good regen. An SC with 100 PR could take them easily though, though it still takes a while to kill them. A load of slingers is great for knocking off their heads, while some PR thugs hold them up, but I guess that is not possible. I think it is 6 hp per head, until the last one, which has 36 hp. So 78 hp total. I may be thinking of the Sacred ones, but I think these are the same except without the sacred tag. Oh, and sent 250 gold to Ashdod. I don't need it, lab is rebuilt, and I am under siege again. So I lost one battle in the East, which thanks to the heroic exploits of my Grand Master Malpruse (RIP) was a lot less painful than it could have been. Arco deployed a pretty nasty reverse communion, with masters with bows and slaves casting Gifts from Heaven, Fireball, and Prison of Fire with reinvig from earthpower etc. A seeking arrow barrage would be the best way to disrupt it I think, or other assasination spells, but we don't have many gems available. Failing that, I can disrupt his precision using Mist while boosting mine using Wind Guide and devastating his army using a teleported in Flaming Arrows to avoid magic duel. It'll be a costly fight. I'm hoping the noobs are going to be short on air gems soon because if my commanders get hit by another seeking arrow barrage it would cost me dearly. I've added three decoys to the most at risk army but they're no guarantee. Machaka's big army is starving pretty badly and it'll be diseases time if it keeps up (no supply items). On the other front I killed Ulm's raiding force to a man and am going to go counter-raiding. As I'm lacking in poison res and probably won't be going against the hydras right now, does anyone have any good targets? Or, I can bail out this turn only to return on next if someone can send me a snake ring. Without good targets I'm just going to drop on Jotun pretender or something. I'm still debating between going all-out against Caelum's lands or just sitting on Jotunheim fort. Both have their advantages. Jotunheim has over 100 units, vaettir, some giant javeliners, some hawks, so the fort walls aren't coming down too soon. Taking on Caelum would mean the raiding for territory as he has fliers and at least the capital's defence value is like 750. I'm getting the equipment off TheDemon, so I'll guard your south. I'd like to start going against Caelum but don't dare if I don't know where Baalz takes that sidhe lord of his. Baalz? I'd be attacking 40 and 58 if you won't object.